Despite the temperature in Nashville still in the 80's this week, summer is officially over (says my calendar). From mimosas at brunch, memories with friends, and Miley's new music, this Eats and Beats post is my last ode to summer. As a native Californian, you'd think I'd be used to the abundant sunshine and seemingly effortlessly cool aura of Los Angeles. But since I've traded Southern California for the South, I tend to have a moment of awe every time I go back. Over the Labor Day weekend, I headed back to the Best Coast for my dear friend Melanie's Bachelorette weekend. And what a way to celebrate my friend that is the human embodiment of sunshine. We couldn't stay in Santa Monica and not visit the Sonoma Wine Garden for brunch. As I consider myself a brunch connoisseur (waiting for my official certificate to arrive in the mail), I was excited to visit the place that was voted #1 brunch in Santa Monica for 7 years...casual track record. So good I couldn't wait to eat a slice before I snapped a photo. You know what's better than a fresh mimosa surrounded by friends? Four different variations of mimosa to choose from. I had to start with the OG OJ-champagne combo, but gravitated towards the Elderflower mimosa, which was refreshing and light on a warm day. After we toasted the bride-to-be, it was time for food. The Sunrise Pizza was calling my name from first glance at the menu. 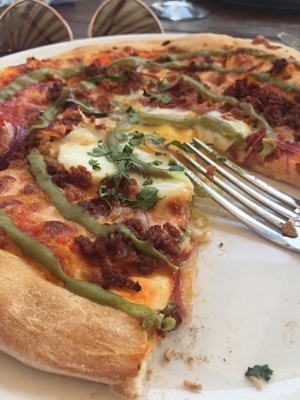 Breakfast and pizza are some of my favorite things so a lovechild of the two is hard to say no to. This was probably one of the best breakfast pizzas I've had. Topped with chorizo, avocado crema, cream cheese, mozzarella, and a cracked egg, it definitely hit the spot for a girl who has been missing her Southwest eats. If mimosas and breakfast pizza aren't your thing, Sonoma has other great dishes and drink options. 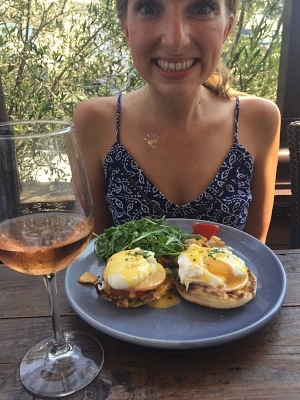 Kristy opted for the "War of the Rosé" and the Sonoma Benedict (their version of the brunch classic, eggs benedict, but with a little avocado and tomato). Beyond the delicious food, we had awesome service and the atmosphere was great. We were a large group of 12 and we all left satisfied with the food, beverages, service, and atmosphere. The restaurant is located on the rooftop at Santa Monica Place and had a constant flow of weekend brunch-goers. If you're in the area or heading to Santa Monica soon, I would definitely sketch out some time for the Sonoma Wine Garden brunch (Saturdays and Sundays from 10 am-3 pm). While we were only in Malibu for an afternoon, Miley's summer jam "Malibu" was on repeat throughout the weekend. This song was on my summer playlist from the day it was released and perfectly captured the Labor Day weekend adventures. It's relaxing, light, fun, and upbeat, exactly the feeling you get when you reunite with old friends. The song makes you want to throw on your favorite shades and sip mimosas while overlooking the Pacific Coast Highway, but not in a "We Can't Stop" party anthem kind of way. It's vulnerable and happy, but tactfully captures the importance of taking in simple moments and appreciating the time we spend with those we love. For those who have followed Miley through the years, it's a different sound. Love her, hate her, or tolerate her (I've been Team Miley since 2006), Miley is showing a different side as an artist and it's new era for her music. If you liked Malibu, Miley's new album Younger Now is out now and a great listen top to bottom. For those trying to hold on to summer for just a little bit longer, throw on some Miley, pop a little bubbly, whip up for your favorite brunch bites, throw on your shades, and eat brunch outside one last time before you have to don your boots, scarves, and flannels. Unless you live in Southern California, where it's always sunny and 70 degrees... in which case, carry on with business as usual.